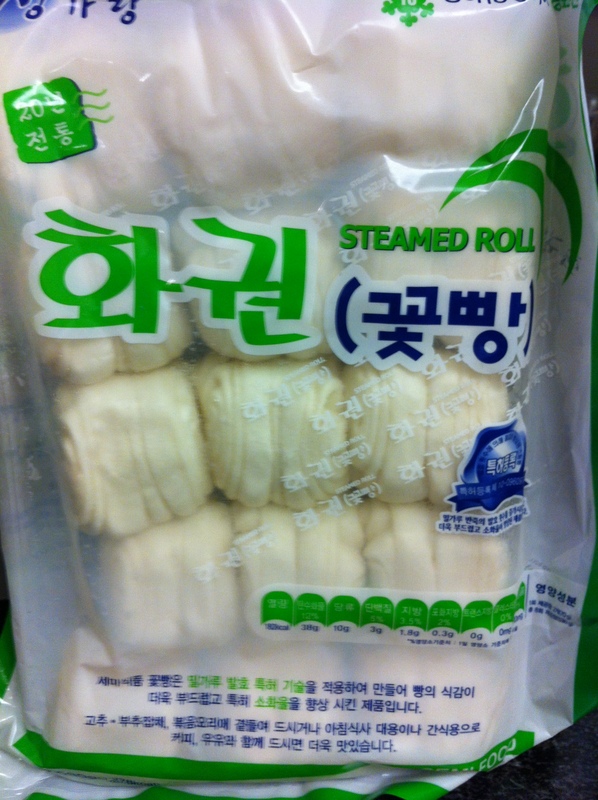 As I was wandering through the frozen isles of the Korean grocery the other day, I found kkotbbang and was ecstatic. I loved kkotbbang since I was a child and had no idea they sold it in the grocery in the US. All I had to do was to follow the instructions on the package and steam the breads for a few minutes. Boochu-japchae is also an extremely quick and easy dish to make, contrasting to the more painstakingly long process of making the traditional Korean japchae (잡채). Boochu is an Asian chive and it doesn’t matter whether you use the Korean kind or Chinese kind. 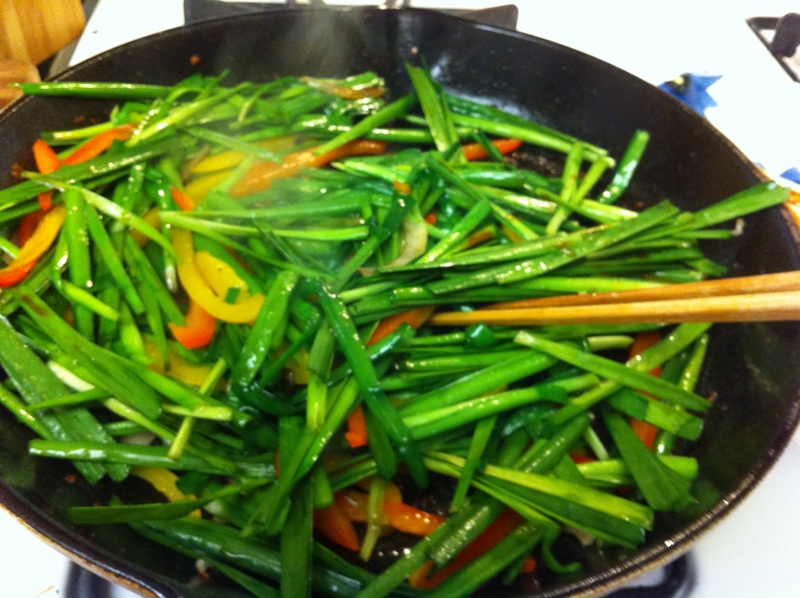 If you do not have boochu, simply replace it with 2 or 3 more bell peppers of any color and thinly julienne them. Use the same method and as boochu-japchae and you’ve got gochu-japche (고추잡채)! Mix the thinly stripped pork with a tablespoon of corn starch and sake each and pinch of salt. Let it sit in the refrigerator for about 20-30 minutes. Wash the chives and let it dry. Cut them into about 4 inches (about 10cm). Thinly julienne the bell peppers. In a large skillet, drizzle about 3 to 4 tablespoons of vegetable oil and sauté the pork on medium-high heat until fully cooked. 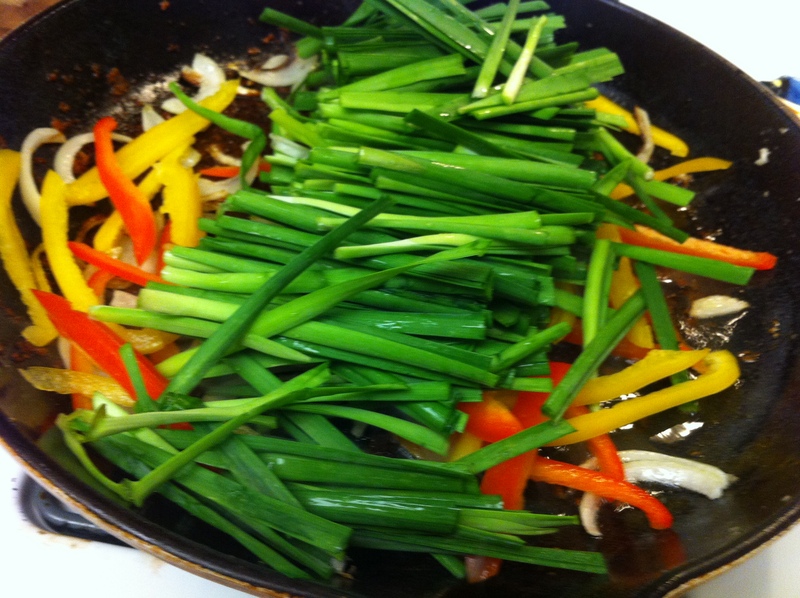 Move the cooked meat to a plate and drizzle another tablespoon of oil on the same skillet. Increase the heat to high and quickly sauté the boochu and bell peppers on high heat for a few seconds. Add soy sauce, oyster sauce, a pinch of salt stir and combine the cooked pork with the sesame oil and a pinch a black pepper. Stir on high heat to combine and serve. 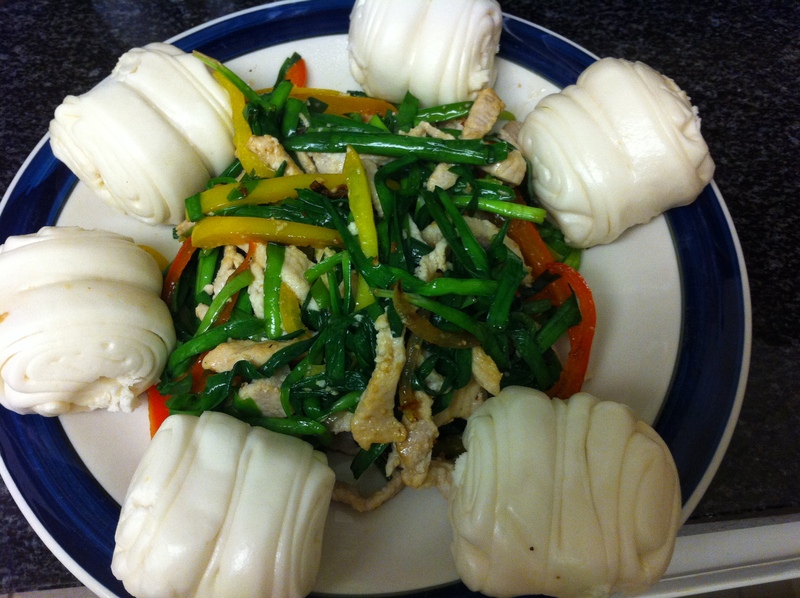 If you have kkotbbang, cook it according to the package instructions. 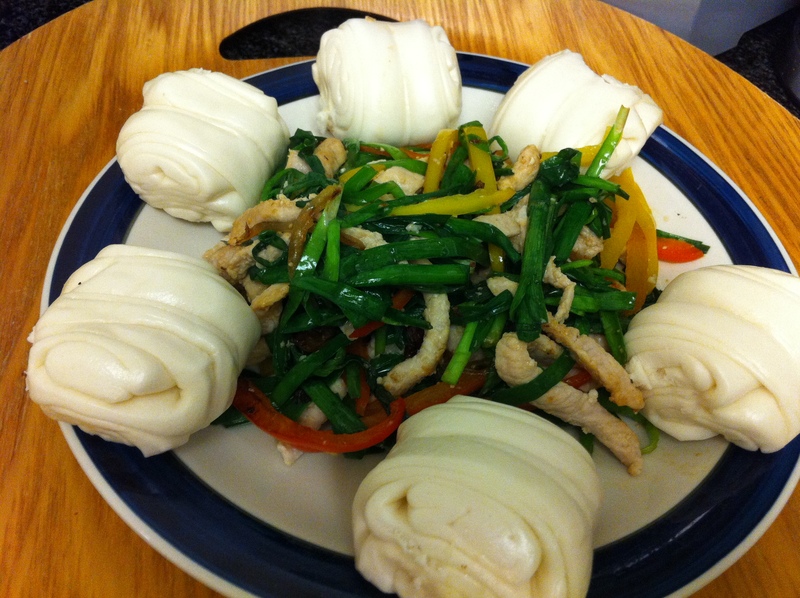 I steamed 6 kkotbbangs by covering the steamer wrack with cheese cloth so the kkotbbang would not stick to the wrack and steamed it for 10 minutes. 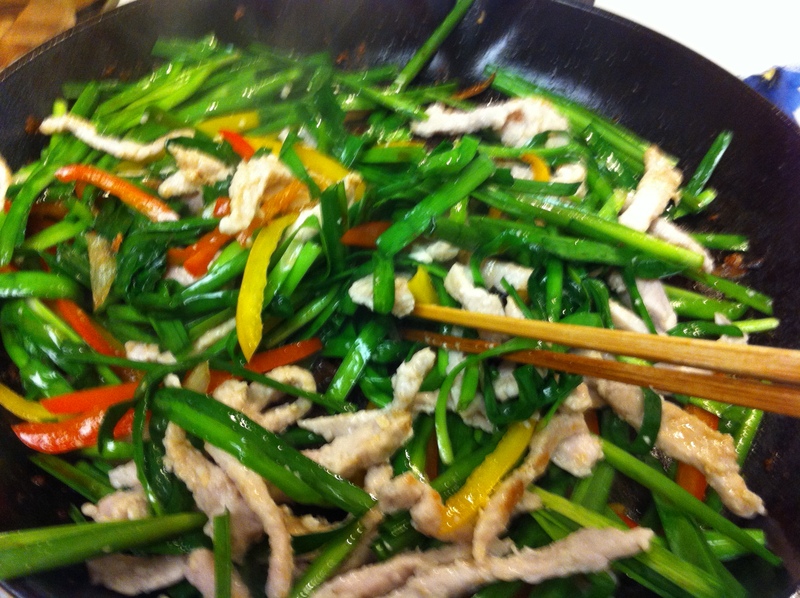 This entry was posted in Good for dinner, Main Dish, Meat/Chicken and tagged Asian Chives, Pork by gangnamkitchen. Bookmark the permalink.